How wonderful it is to go on a private gulet trip for a week! There are so many choices in itineraries. There is also the freedom to explore on land as well. It’s a holiday combining the best of a private yacht holiday in the Eastern Mediterranean and the ancient wonders of Southern Turkey. One such exploration that is available, with an embarkation in Marmaris harbor, is a route to the stunning Gulf of Fethiye. So many itineraries to choose from, but which one? Why don’t you let us advice where to go? Our team is highly experienced on this subject, so you just tell us your criteria and we do the rest. The Marmaris – Fethiye – Marmaris gulet itinerary includes many interesting places to see along the way. Among the destinations, is an traditional journey to the ever so famous Dalyan for the Dalyan Caunos Tour. Travelers hear and see photos about this unique place with all its ancient ruins – more so the King Rock tombs from the Lycian period. Then of course is the renown mud baths of Dalyan. If you have opted for this route for your luxury gulet charter in Turkey, then here below is a map explaining the connection from your gulet to see places in Dalyan. Private charter gulets moor in Ekincik Bay. The trip from Ekincik to the Iztuzu beach is about one hour. From your gulet a piyade (river boat) arrives and takes guests from Ekincik to the Iztuzu Beach (Turtle Beach) as gulets are not allowed to this beach due to the fact that it is a protected area and the breeding grounds for the Carretta Carretta sea turtles. There will be a brief stay at Iztuzu Beach and then its off to Caunos and Dalyan Mud Baths. You may also wish to visit the charming town of Dalyan and pick up a few souvenirs. It’s a lovely little Turkish town. The piyade travels along the Dalyan Delta, through tall reeds. 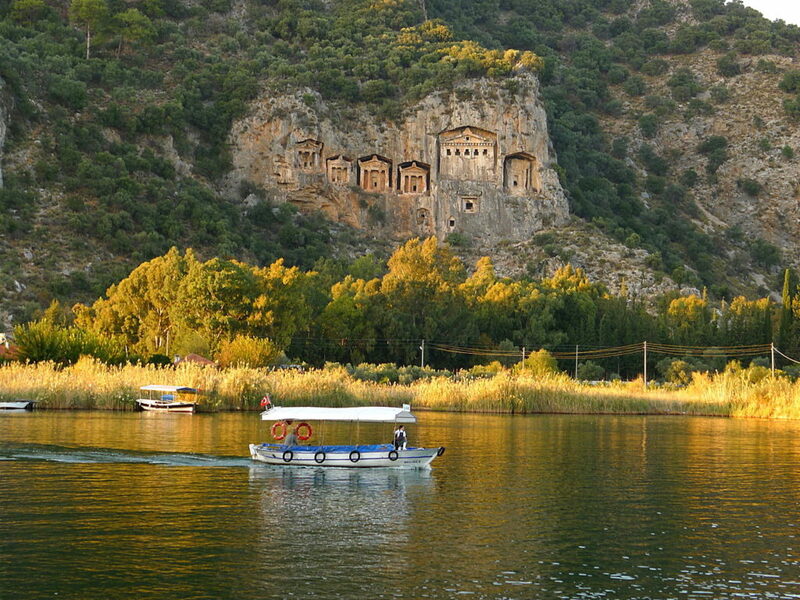 As you near the town of Dalyan center, to your left you will see the King Rock Tombs from the Lycian period. It is forbidden to go into the tombs. However a visit to the ancient city of Caunos will offer you sightseeing. There you will be able to see the hamam, church, amphitheature, temple, and agora (marketplace). Photos can easily be taken from the piyade of the Rock Tombs. More can be taken when you reach Caunos. There is no particular guide but the piyade captain will explain about these sites to visitors. Further up the river – which by the way was the place where they filmed the movie “African Queen” starring Humphre Bogart – you will reach the Dalyan Mud Baths. After a great time in the mud, there is a pool filled with natural thermal waters to relax and wash off all the mud. After your time in the Dalyan region is over, then it’s time to return to your gulet with a return trip in a piyade, and again through the Delta and back to Ekincik Bay. The cost of this tour is extra and generally not included in your private gulet charter cost.